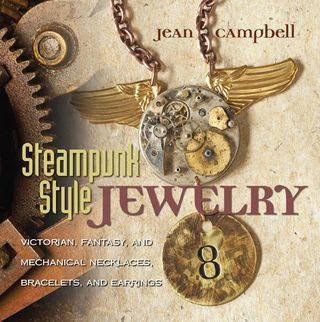 A while back I was contacted by Jean Campbell and invited to participate in a compilation book she was working on called Steampunk Style Jewelry. Of course, I leapt at the chance. I love this genre and I'm very fond of working to a theme, plus Jean is respected colleague and I like her immensely. I was so excited to finally get my copy of the book, I immediately sat down, opened it up and dove in! Jean has done a brilliant job of capturing the spirit of the Steampunk movement through extensive research, the book is filled with gorgeous photographs and detailed information. If you've been intrigued by this genre and unsure about it's roots, you'll discover a long standing tradition of costumes, accessories, decor, film and literature that explores and celebrates the concept of the romantic Victorian era aesthetic married with the cold mechanics of modern technology. Think of the books of Jules Verne and H.G. Wells, the films of Terry Gilliam and even classic films like Metropolis or Chaplin's Modern Times. Man has struggled uncomfortably with the complexities of technology since its arrival. Perhaps this movement is a way of coming to terms with what has been lost and what has been discovered since we ushered in the era of industrialization. Steampunk is an amalgam of anachronistic approaches to artistic expression and this book explores and illuminates it beautifully. Inside the lovely rustic cover are a series of beautiful mixed media infused step-by-step designs created by some of the biggest names in the DIY jewelry making world. From lace and metal festooned cuffs to rings, earrings, necklaces and bracelets made from a plethora of gears, chains, ephemera, watch parts and found objects, you'll find something to excite your imagination on every page. Jean has liberally sprinkled information, images and historical fun facts throughout the book. It's a truly fascinating read even if you don't intend to recreate the designs. There is a comprehensive front section with materials and techniques needed to explore the projects and a generous gallery section with photographs of extraordinary Steampunk style designs by noted artists like Richard Salley and Justin Giunta. Steampunk continues to be an influential design movement and if you've wanted to explore it further, this book is an excellent guide. Hit the flea markets and the thrift stores in search of found objects and forgotten treasures you can use to create your own Steampunk masterpieces with the inspiration you'll find in Jean Campbell's wonderful new book Steampunk Style Jewelry. I was in love with Steam Punk before I even knew it had a name or a following. I love The HG Wells Time Machine movie ( 1960's). I have asked for this book as well as some others. I hope I get to see and read it soon! I am anxious to see your "take" on the style too! I added HG Wells into my post, how could I forget him? Thanks for the reminder! It's a fascinating style and I've collected Victorian era bits and pieces for a number of years, so I find it a comfortable place to explore. Great review! I was just looking for something in the genre for a friend :) Thank you! Wow, Madge, you really "connected the dots" for me. I didn't "get" the whole steampunk thing before. Now I want to know (and create) more. Thank you. Looks like a great book & you did an excellent job describing this jewelry genre. Sounds like a great book! Can't wait to check it out!